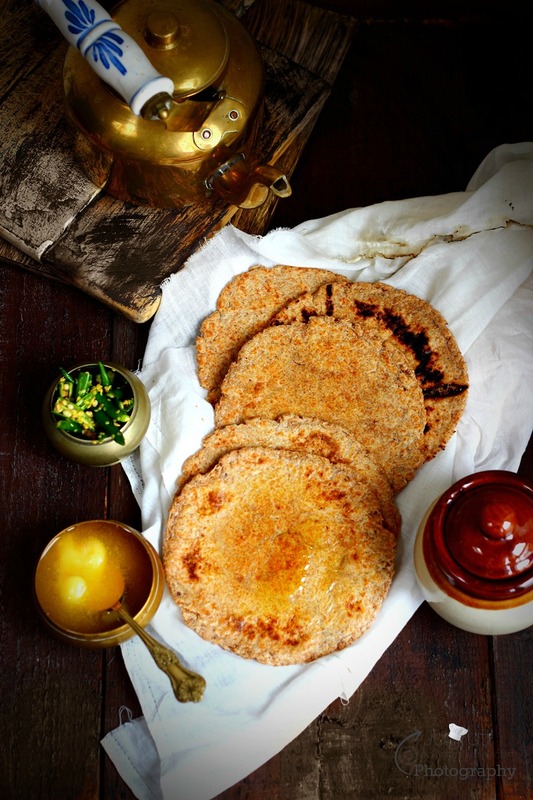 Bhakhri , traditionally it has been farmers food and it's a healthy one, one of the everyday breakfast in Gujarati households. If not breakfast , you will see them appear in your dinner plates. Crispy yet buttery, almost like savoury biscuits and can be eaten with various things like sabji, curries, pickle, chutney, yogurt, chaas and Masala Chai or even on it's own. 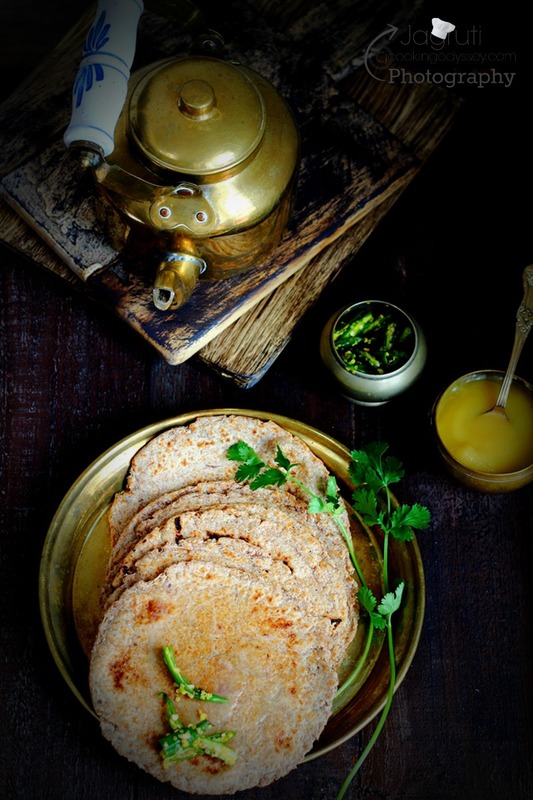 Traditionally Bhakhri is made with coarse wholemeal wheat flour,which is full of fibre and many other minerals, that is why it is advisable to consume it in the morning or dinner time as it's good for digestion, especially people in rural areas preferred having Bhakhri than normal chapatti. In the evening they prefer saadi khichdi, saadi Bhakhri and milk or chaas ( Buttermilk ). Although to make Bhakhri, you will need just few ingredients, but flavours can be altered by just adding couple of spices to it. 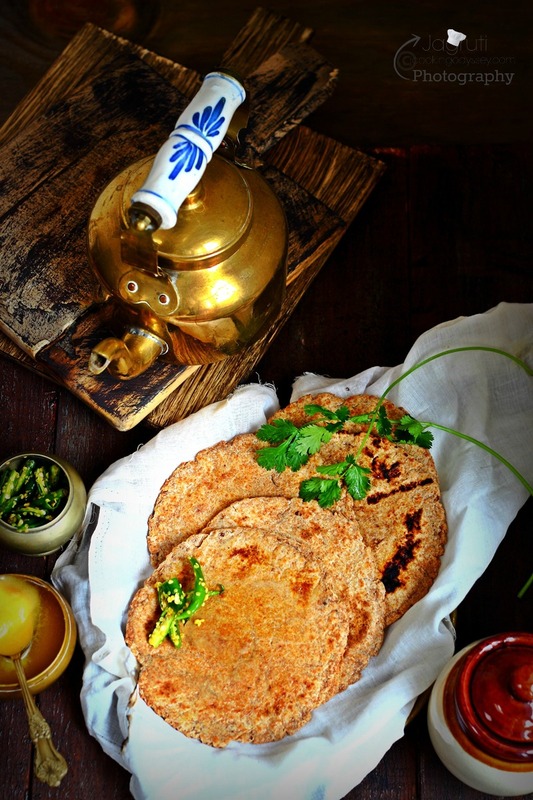 Bhakhri can be cooked with two methods, some people roast Bhakhri on the Tawa ( griddle ) whereas others cook one side on the tawa and rest of the side direct on the heat and serve it with the ghee. The most popular and traditional Bhakhri is Saadi ( Plain ) Bhakhri which is very simple to make. Bhakhri stays fresh for longer time and useful while travelling or great for kids lunch boxes. So how often do I make Bhakhri in my house? maybe once in 4-5 years !!! Surprised , I used to love Bhakhri while I was young, but Mum hardly made Bhakhri as she wasn't keen on using quite a bit of oil, and I grew up with same thoughts too so I do not make these very often too. Bhakhri, crispy and buttery almost like biscuits, Gujarati unleavened bread. Combine everything, and add little water at a time and knead hard but pliable dough. Roll out each ball into small circle, not too thin or thick. ( You don't need dry flour to roll the bhakhri )Heat the tawa on a medium heat, place bhakhri on the heated tawa. After few seconds, turn the bhakhri other side and cook until you can see brown spots. Now, if you want to roast bhakhri on the tawa, press the bhakhri with clean muslin cloth or spatula and cook until crispy ( On low heat ) or roast direct on the heat. Apply ghee on the hot bhakhri and serve.